Flight of Medea Red figure, 530 BCE, Calyx Krater There is a Greek key design as well as a palm frond design. 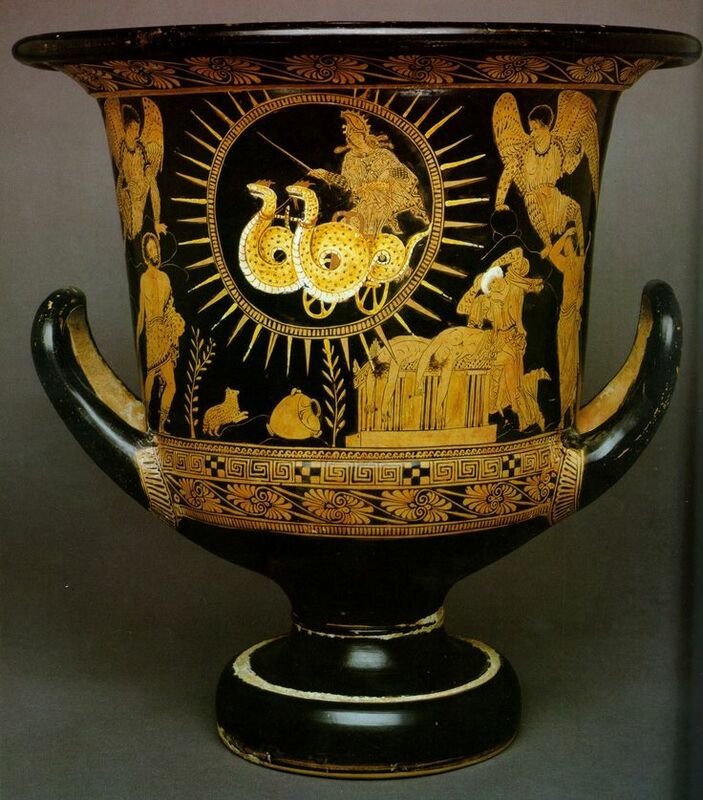 The centre figure is a hydra (two heads and one tail) pulling a chariot with a god riding it. The circle looks like a sun and is coming from the sky. There are angles (there are no angles yet?) around the figure holding wire or rope (or is it a crack). The winged men are escorting the chariot. There are two dead people on tables and one standing beside them. The vase is knocked over and beside it is a dog/sheep. The person beside the table has white hair, someone important? There are lots of detail in the wings and a repetition of pattern through the vase. Linear organization with horizontal and vertical placement. Balance between the figures, they are evenly placed on the sides and the dog and vase add weight to balance the dead people on the table. It is a narrative with the god coming on the chariot to bless the dead people. The colour comes from the clay and extra colour is added for affect.